Located in NW Tallahassee (just across the line that separates east from west), Lakeshore Estates is a very popular neighborhood featuring median priced homes. 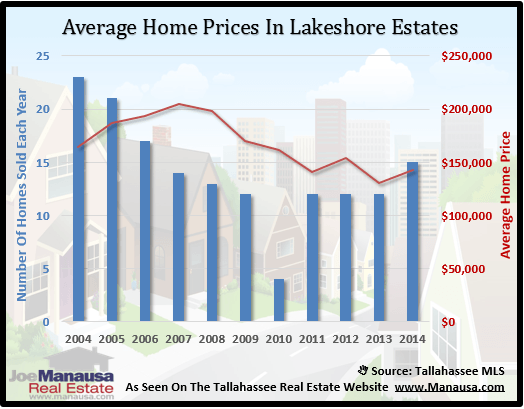 Low mortgage interest rates combined with fallen home values makes this the most affordable time in memory to buy a home in Lakeshore Estates. 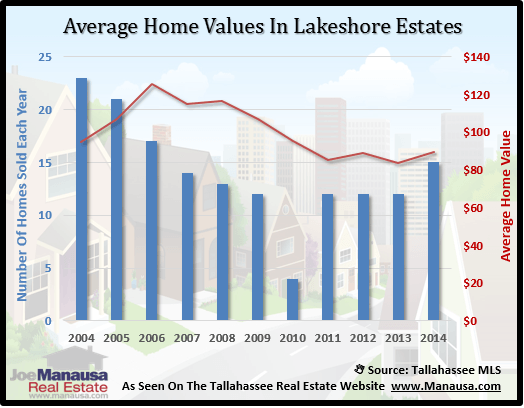 Today's report will take a look at average home prices, average home values, and average home sizes, as well as current listings and recorded sales in the Tallahassee MLS. Affordability is the biggest draw to Lakeshore Estates, as buyers have a selection of "older" homes built mostly from the 1960s to the late 1980s. Additionally, homeowners here have great access to Tallahassee, with a very centralized location that is only minutes away from shopping, schools, and the entire Lake Jackson complex. All the real estate graphs in this report compare the number of homes sold in Lakeshore Estates (blue columns, measured on the left vertical axis), with an important real estate statistic. This first graph shows average home sales prices in Lakeshore Estates each year, going back to 2004. Average home prices are still 30% lower than when they crested above $205,000 in 2007. Thus far in 2014, the average closed home sale went for just under $143,000 with 15 homes sold. Home values remain near a 12 year low, with closed home sale values recorded this year at $89 per square foot. Considering the cost of land development, these values are likely below 50% of what it would cost to replace them with new construction. It's no wonder Lakeshore Estates is having a strong year. 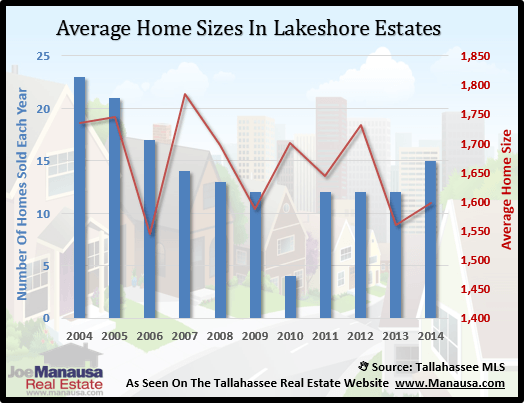 The average home size in Lakeshore Estates typically falls between 1,500 and 1,800 square feet. When looking at this year's average home size of 1,598 square feet, Lakeshore Estates is bucking the trend. As most neighborhoods are seeing the larger homes selling, this popular NW Tallahassee neighborhood is seeing the opposite, with the smaller homes selling. I would expect to see this trend reverse over the next 12 months. The following list shows home sales going back to 2002 in Lakeshore Estates. I hope you enjoyed our September 2014 update on home sales in Lakeshore Estates, please feel free to drop me a note if you have questions not covered in this report.